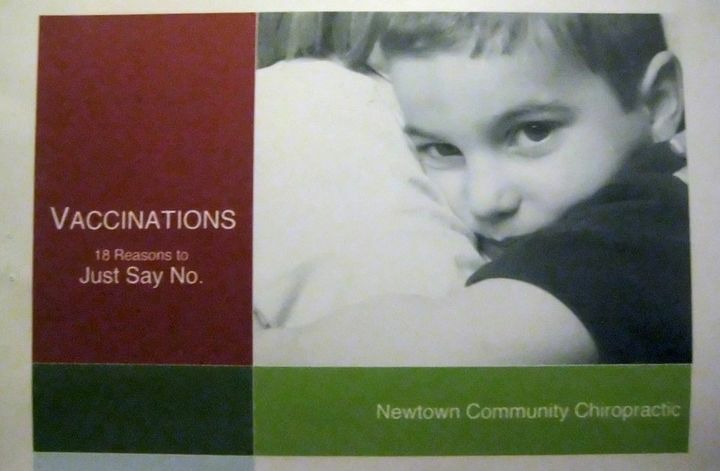 The last few months haven’t been great for pediatric chiropractor and owner of Newtown Community Chiropractic, Nimrod Weiner. 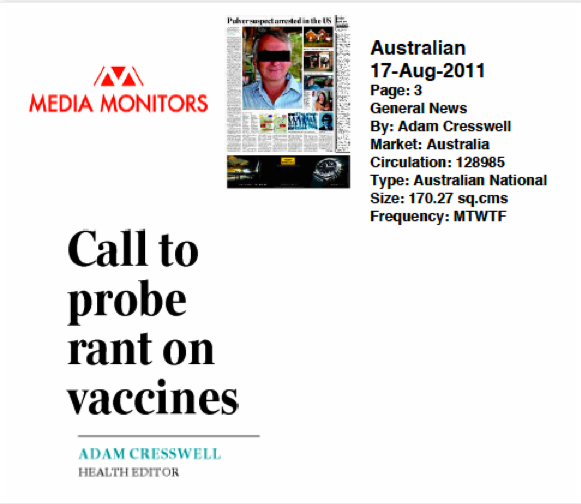 It all came to a head last week when his anti-vaccine “rants” were covered by our national media when The Australian newspaper and Radio National both took him to task over his public anti-vaccine lectures. The stories came after Australian Doctor published the audio of his talk online, against his wishes but in what they say was in the public interest. Why is it in the public interest? Because Weiner gives talks to parents, pregnant mothers and young mums and effectively scares them into not vaccinating. Also, he’s the Vice President of the Chiropractors Association of Australia (CAA) NSW branch of whom Australian Doctor have previously accused of “fundamentalist ideologies” and “pseudoscientific dogma”. 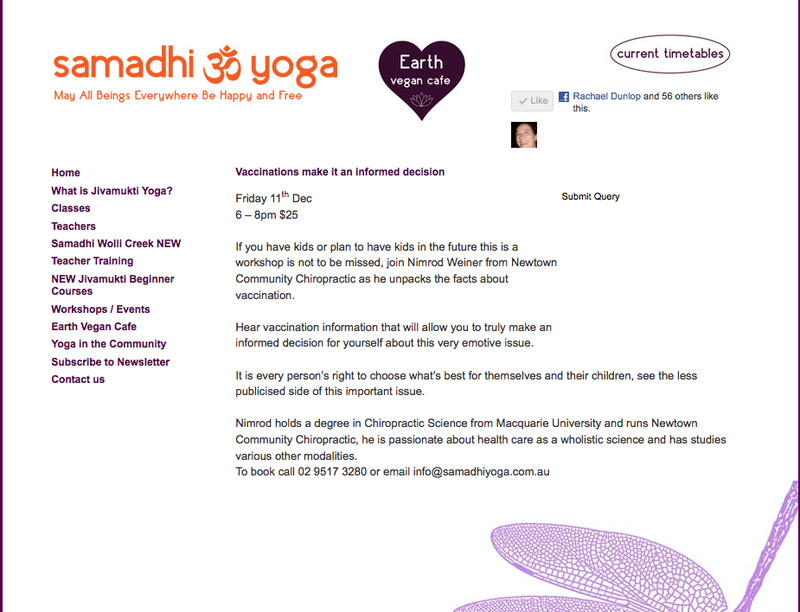 He’s also on the board of the Australian Spinal Research Foundation where he contributes content for the newsletter. So effectively, he’s a high profile chiropractor. But leading up to the bad news week for Weiner was a heck of a lot of work behind the scenes. I thought it might be interesting to track the chronology of events which resulted in him getting pwned all over the media. 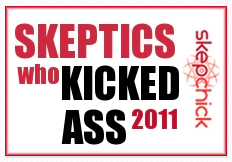 Hopefully, it will give readers an understanding of the value of grass roots scepticism and how a little bit of investigation, like asking questions at the Mind Body Wallet Festival or spending two hours in a chiropractors clinic can result in exposing dangerous quackery. 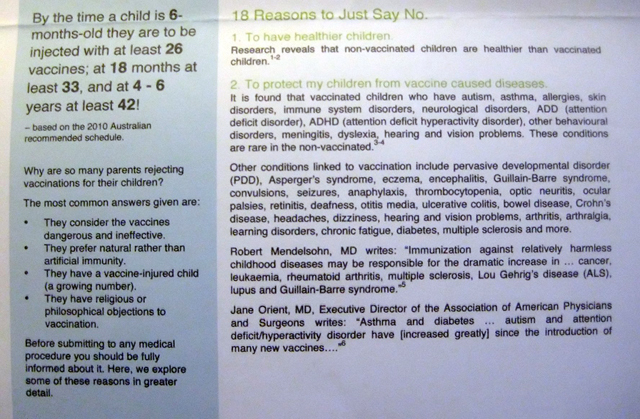 And anti-vaccine quackery is particularly dangerous. November 14th, 2010. My mate Richard Saunders came across this flyer at the Newtown Festival last year where Newtown Community Chiropractic had a stall. He twitpicked it and we decided to go along (Richard didn’t end up going – we can’t remember why). December 4th, 2010. I attended the 2 hr free seminar with a friend and blogged it here the same day. Or watch it on the YouTube (thanks to the kind soul who made it). March 8th 2011. A journalist from Australian Doctor contacted me as part of researching a feature on CAM published as Exploring the Alternatives (I eventually wrote a guest editorial). He was curious about chiropractors and their views on vaccination and knew I had been to listen to Weiner. He booked to go along to the seminar in March. He recorded the seminar, identified himself as from Australian Doctor and asked Weiner if he could post it on-line. Weiner declined. (Note: according to the Australian Doctor article – which is paywalled – Weiner claims he’s done five years of a medical degree. I was unable to confirm this). To provide you with some context for what happened next, chiropractors were copping it around this time for treating babies. March 18th 2011. The first stories about a chiropractic clinic at a Victorian University treating babies and kids appears in national newspaper The Australian. Spearheaded by Loretta Marron, academics and health professionals including Simon Singh and Edzard Ernst petition the government to close the clinic down. April 27th 2011. 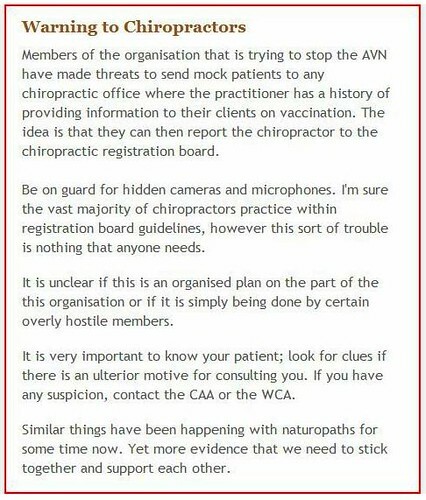 Australian Doctor are the first to link chiropractors with the anti-vaccine group the AVN revealing that 130 of professional members of the AVN are chiropractors. This includes clinics run by the CAA president Simon Floreani, the association’s treasurer Taylor Vagg and board member Anthony Croke. “Mr Floreani….insisted AVN was a valuable resource for patients: “For me it’s about critical thinking. You are only going to get one biased side of the debate from the medical profession. Can you trust the claims that the vaccines are safe when one-fifth of all deaths are related to medical error? The decision sparked a reaction from the anti-immunisation movement in Australia, with one sceptic, paediatric chiropractor Dr Warren Sipser, saying the judgment was “dangerous” and some children could have severe reactions. July 11th 2011. The CAA sent a media alert out to their members about damage control, directing their members to send all media enquiries to a PR firm. July 24th 2011. 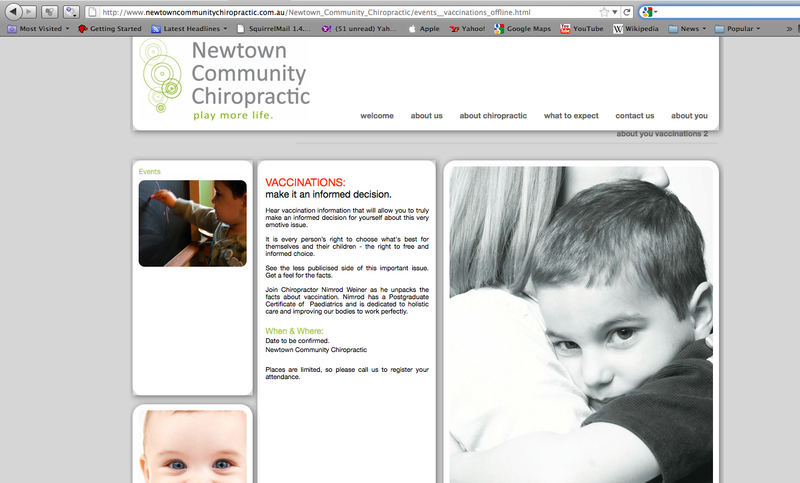 I received a call from a journo who was investigating how widespread anti-vaccine beliefs were amongst chiropractors. The story was published a few days later. We…reported on accusations against the Chiropractors Association of Australia – the profession’s peak body – that it has turned its back on science to peddle “fundamentalist ideologies” and “pseudoscientific dogma”. The CAA has strenuously denied the claims. On the issue of vaccination, it says the profession’s role is to educate the public on health issues – the risks and benefits of vaccinations is just one of those issues. 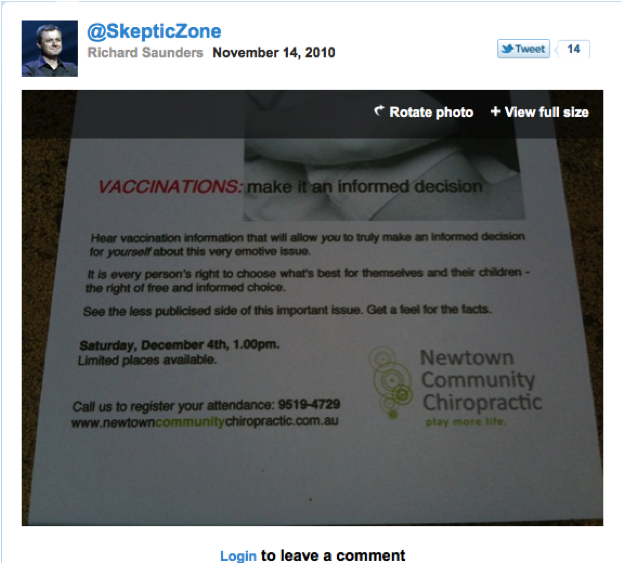 So here we offer a talk on vaccinations given to members of the public by Nimrod Weiner…..vice-president of the NSW Chiropractors Association of Australia and ..on the board of the Australia Spinal Research Foundation, a self-styled scientific research body. August 15th 2011. Another journo, again from The Australian newspaper emailed to ask me about the Australian Doctor audio, since he knew I had blogged about the talk. A story entitled “Call to probe anti-vax rant” was published on August 17th (seen by approximately 128,985 people) where Weiner’s comments were described as “outrageous” by the Australian Medical Association who called on the CAA to intervene. August 18th 2011. The following day, the story appeared on Radio National on the back of Australian Doctor audio and The Australian newspaper article. 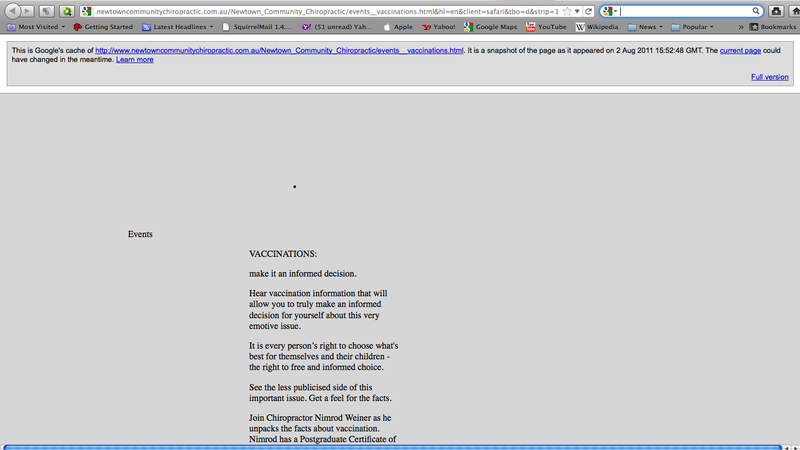 Interestingly, shortly after these national stories broke, a link on Weiner’s website to his vaccine talks was showing a 404 but it could be found in Google cache. Today, as I was researching to write this article I again found the page, but it appears an attempt to hide it has been made, as indicated by the “_offline” text at the end of the url. You can still get the page though if you do some digging, but it has been moved thus breaking all previous links. I guess the question now is will Weiner continue to give these seminars. According to this screenshot he has previously charged for the seminars. 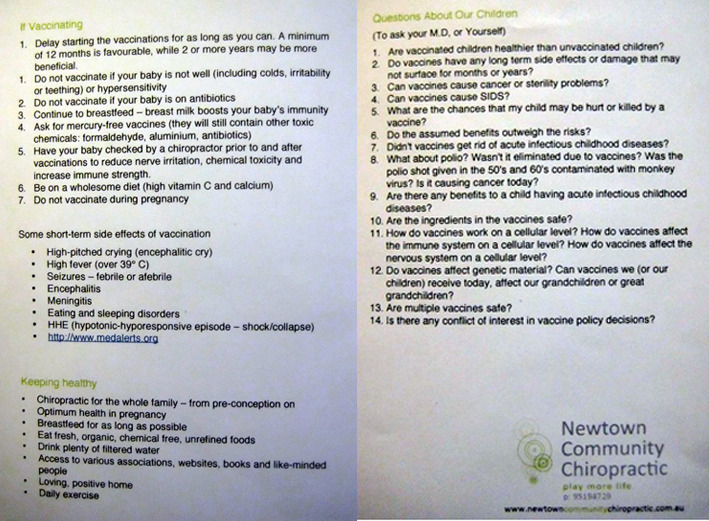 The chair of the chiropractic board is urging people to make a formal complaint about high-profile chiropractor Nimrod Weiner over his public seminar on the alleged dangers of vaccines. Phillip Donato stressed that chiropractors had a duty under the profession’s code of conduct to provide up-to-date, evidence-based information. He said: “It appeared at the very least he is misinformed and may be providing misleading information to the public. We would encourage notifications so that we can have a look at the case properly.” Australian Doctor understands that notifications have already been made. I don’t think we’ve seen the end of this saga. I’ll be sure to keep you posted.